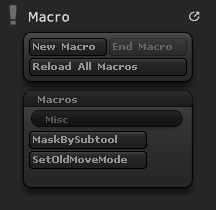 The Macro > Macros sub-palette contains the buttons for recorded macros that have been saved to a sub-folder of the ZStartup/Macros folder. Each sub-folder will be displayed here as a separate section that can be collapsed/expanded. The Misc section shown above is a sub-folder that is installed with ZBrush. You can create other sub-folders if you wish. Note that if you save a macro directly to the ZStartup/Macros folder then it will not display. Any of the macro buttons can be made part of a custom interface arrangement.